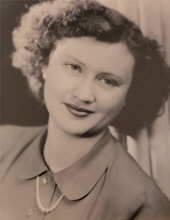 DURHAM: Mildred Sykes White, 93, passed away on Wednesday, March 27, 2019 at Treyburn Rehabilitation Center in Durham. She was born in Wake County to the late Milton and Oma Hurst Sykes. In addition to her parents, she was also predeceased by her husband, William C. White. Ms. White is survived by her sons, John T. White, Joseph White (Barbara); daughters, Joyce W. Cates, Janet W. Blanks (Joel); grandchildren, Matthew Pearce (Emily), Amanda Ruff, Angela Combs (Allen), Amy Clough (Tony), John Michael White; step-grandchildren, Robin Dillehay, Joel Blanks II, Allen Blanks; and 16 great-grandchildren. The family will receive friends from 6 to 8 p.m. on Thursday, March 28th at Clements Funeral Home in Durham. A funeral service will be held at 1 p.m. on Friday, March 29th at Clements Funeral Chapel in Durham. Burial will follow in Woodlawn Memorial Park. The family invites friends to join them immediately following the graveside service in the Gathering Room at Clements Funeral Home. To send flowers or a remembrance gift to the family of Mildred Sykes White, please visit our Tribute Store. "Email Address" would like to share the life celebration of Mildred Sykes White. Click on the "link" to go to share a favorite memory or leave a condolence message for the family.